Robotic Welding | Desmarais & Gagné inc. 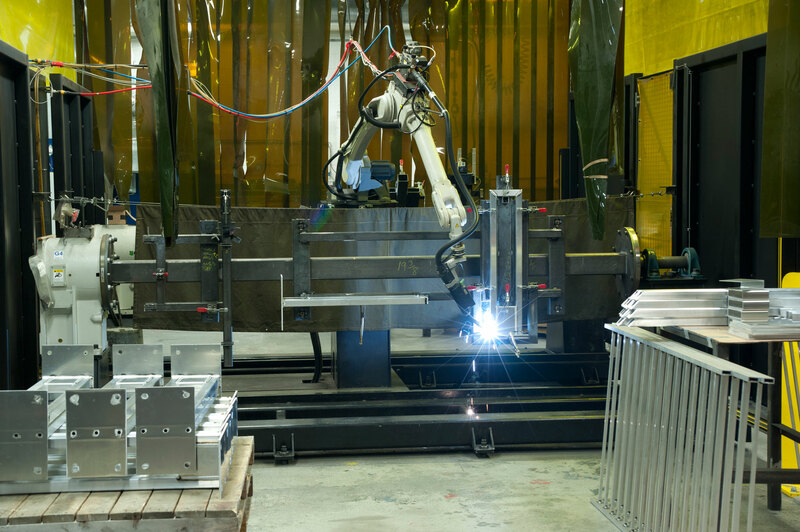 In 2018, our team made an acquisition of 2 new PANASONIC welding robots. Equipped with cutting edge technology, our now 6 welding robots allow a capacity of 9 working axes, with a precision of +/- 0.006 (inches) and a 13 foot movement radius . These robots work using pulse and micro-pulse arc processes. This allows for high penetration in materials and leaves a quality surface finish avoiding any deformation. The use of this equipment, compared to manual welding, gives a better temperature control, avoids component deformation and reduces rejection of the final product during quality control. Furthermore, the welding of large parts or complex shapes can always be accomplished with the same level of precision and uniformity. Several mandates entrusted to our company over the years have allowed us to enlarge and diversify to get us where we are today, the leader in robotic welding solutions. Our accreditations include CSA W47.1, CSA W47.2, ISO 9001:2015 and a strict adherence to our quality standards ensures customer results that always meet their expectations.